One of artist Troy Nickle’s exhibits at the Alternator Centre for Contemporary Art. Artist Troy Nickle, whose work is on exhibit at the Alternator Centre for Contemporary Art, is creating an art installation at the Eco Culture Centre at Woodhaven nature conservancy, 969 Raymer Rd., Kelowna. 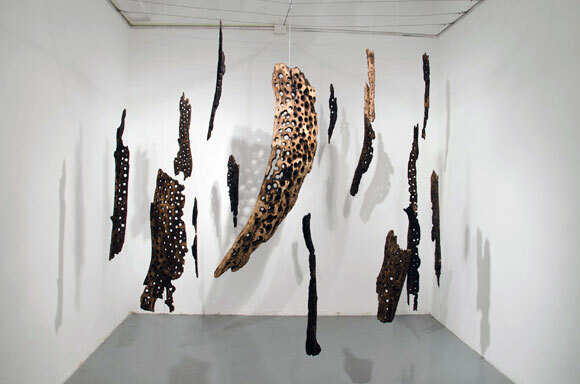 Process, Place and Perception, an installation using local natural materials, can be viewed at the Alternator Centre, 421 Cawston Ave., Kelowna, until September 6. Nickle’s works elicit images of natural settings. In one, a selection of dried plants horizontally emerges from the wall to provide a bird’s-eye view of the world. Another installation component is a mural, made with mud and soil, illustrating the Okanagan landscape. Driftwood, both suspended from the ceiling and dynamically gathering on the walls, creates a sense of movement reflective of floating down a river. Central to the exhibition is a sculptural homage to Constantin Brancusi’s Endless Column, with wood stacked columns and columns high. Each work aims to address relationships between culture and nature. Nickle is extending his artwork into the public with an outdoor installation at the Eco Culture Centre. The final work will be on display this summer. Nickle is an interdisciplinary artist based in Lethbridge, Alberta who creates works that address nature, culture, place, and temporality. He has studied at the University of Lethbridge and at the Alberta College of Art and Design and his work has been exhibited in Lethbridge, Calgary, Waterton, Toronto and Kamloops. The Woodhaven Eco Culture Centre is located in a 3.5-hectare nature conservancy in a wildland corridor along Bellevue Creek which flows from Myra Bellevue Provincial Park. With an agreement with the Regional District of the Central Okanagan, which recently acquired the site, the Faculty of Creative and Critical Studies manages a large heritage home on the property that is an ideal place to hold small retreats, art projects, events, and performances.